Register today for the 2017 Psychonomic Society Annual Meeting in Vancouver, British Columbia, Canada. All attendees are strongly encouraged to preregister through this website to avoid lines onsite. When you arrive in Vancouver, stop by the Psychonomic Society registration desk located on the second floor of the Vancouver Convention Centre West during the times listed below and pick up your name badge and tote bag. Registration is still free for current members. Registration includes unlimited access to all symposia, talks, poster sessions, receptions, and exhibits. All members must register. Registration fees for non-member PhDs and graduate students are $75.00 (undergraduates are free, but you must still register). This is a new policy effective at last year's meeting. Membership in the Society is inexpensive and strongly encouraged. Please visit our Join Now page to become a member. 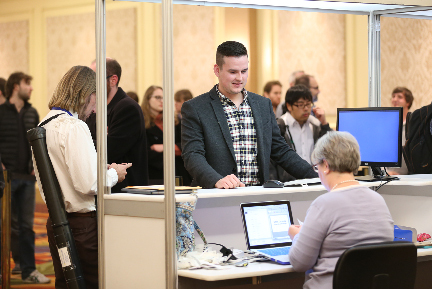 Registration includes unlimited access to all symposia, talks, poster sessions, receptions, and exhibits. All non-member attendees must register. Wednesday, November 8 4:00 p.m. - 8:00 p.m.
Thursday, November 9 7:30 a.m. - 8:00 p.m.
Friday, November 10 7:30 a.m. - 6:00 p.m.
Saturday, November 11 7:30 a.m. - 5:00 p.m.
Sunday, November 12 7:30 a.m. - 12:00 p.m.
Requests to refund registration fees will be considered if received via email at info@psychonomic.org by November 1, 2017. A $25 processing fee will be retained. Refunds requests will be processed after the meeting. "No shows" receive no refund.